Periodically I like to post my classroom observations. As a principal, I feel it is important to understand what is going on in the classrooms so I can help and support the teaching and learning. I always enjoy learning new things! 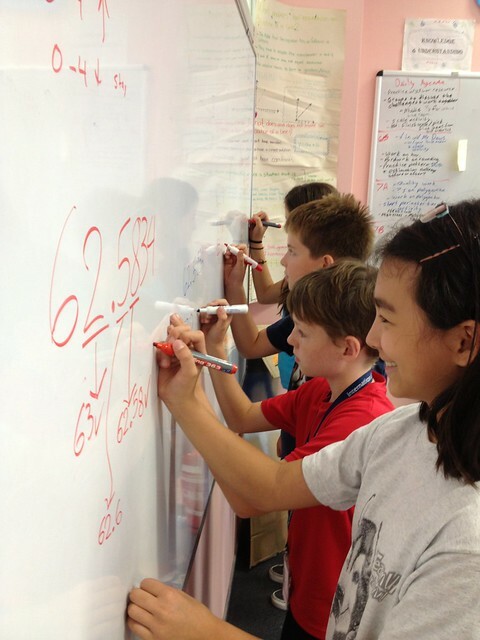 The Grade 6 Mathematics students were practicing rounding decimals. Half the class was working on the board (below) and the other half were working at their desks. A sample problem was to round the number 78290 to the nearest hundreds place. My answer – 78300, which was correct. The seventh grade science class was listening to a lecture. Science teacher Janice Medenica was sharing a student cartoon on how fungi spread spores through insects. The idea was to demonstrate good note taking skills, dividing the paper into input and output. The output shows the teacher that the student understands the material. The input side are the notes from the information source (lecture, video, reading) and the output is showing how this information fits in the student’s schema. This could include a rap song about fungi or a cartoon. The grade 12 psychology class working on presentation on a knowledge issue in the field. For example, Sreta (below) chose Doping in Sports because he is a hockey player and learned from a former National Hockey League player that many of the players use performing enhancing drugs to keep up with the rigors of an 82-game season. When he participated in the world Under-18 hockey championships, several of his teammates were tested. He was looking at sources when I sat down next to him. It looked like it was going to be an excellent presentation. The grade 11 English class was discussing the DP Classroom Without Walls trip to Bosnia, with stops in Višegrad, Mostar, Sarajevo, and Trebinje. The trip will concentrate on the history and literature of the region, including Nobel Literature Prize winner Ivo Andrić’s book, Bridge Over the River Drina and the origins of World War I.